Now The Details: The People's Republic of Canada on Monday? The People's Republic of Canada on Monday? 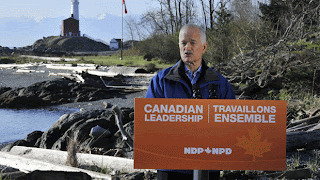 Jack Layton, NDP Prime Minister in Waiting? Some American friends and colleagues are asking, "What the hell is going on up there?" Yes, exciting times here in the Great White North. I would not have believed this could ever happen, but the Liberals seem to be on the verge of being relegated to the 3rd party. The NDP under Jack Layton seems poised to become the Official Opposition. It's possible but far from certain. My guess right now is that the Liberals will hang on as the second party in the Commons. The Tories will likely form a minority government. But if/when that happens, Harper is gone. He's already being asked by those pesky journos if he will resign if he fails to deliver. He hasn't said no. Harper's lack of affect has been seen as arrogance by urban sophisticates. He still commands much loyalty in western Canada and in exurban areas for his handling of the economy through the Great Recession. Canada emerged relatively unscathed especially compared to the US. This seems a likely scenario: Prime Minister Stephen Harper wins the most seats (there are a total of 308 in the House of Commons). He need 155 for a majority. The latest polls show him at around 140-147. The Liberals may fall to third place if present trends continue. Harper has to reintroduce a budget in a few weeks and most likely, it will be defeated by a combined opposition vote. One of the sharpest blogs on this is http://www.threehundredeight.blogspot.com/. They are still predicting a Liberal Opposition but with the NDP closing in, it still could change over the weekend. It's that close and that volatile. Parliamentary tradition has it that if a government is defeated on a budget, it must resign. Calling another national election would be legally possible, but highly unpopular and hugely expensive. So Harper would be forced to go to the governor-general who, as the Queen's representative can then ask the leader of the party with the next largest number of seats to form a government. Or the GG could asked Harper to stay on, try again and resubmit another budget or even ask some members of the opposition to sit in cabinet. Lots of possible scenarios. Layton is a charming guy, an English Montrealer who speaks good French and is married to a Chinese Canadian NDP MP (my constituency). He is also an avid cyclist. He fits the bill as the modern lefty, even if the Tories are calling him the "Boy Stalin" in private conversations. Long gone are the party platforms calling for nationalization of the means of production. new entity from among three right wing parties - the Reform Party of Canada (a bunch rednecks from Alberta), the Progressive Conservatives (so-called Red Tories from Ontario, much like the old New England/NY Republican types - Lowell Weicker, Nelson Rockefeller, etc.) and the Conservative Party which was made up of small business people. Much like the Republicans, it is riven with opposing tendencies, united only in their hatred of Liberals and liberals. Harper created a relatively effective political force, held together largely by Harper's own force of personality (he is alleged to be the consummate control freak). His coalition which lasted about 8 years, should continue after he leaves. But Canada tends to skew leftish politically, so the next Conservative leader will have to soften some of the core Tory approaches, especially around gun control and abortion if he or she wants to create a big tent on the right. The vote is on Monday and the advance polls had a huge turnout - 35% more than the last election. This time another record turnout is expected. In this election, the media in general, have done well in finding a balance between the horse race and the issues. But the reporting has not been helped while this is happening in the midst of hockey playoffs and the Royal Wedding. But sometimes the news is just what everybody's talking about. There will be time enough after Monday to pour through the political entrails.